Growth Habit: Wild Mignonette generally grows from 80 to 150cm, whilst cut-leaf mignonette reaches 60 cm. The leaves of cut-leaf mignonette are deeply divided into 3 lobes, whereas those of wild mignonette are undivided. Type of Plant: Both Wild and Cut-Leaf Mignonette generally grow as biennials, however in Tasmania they often grow as an annual, or even perennial for several years. Flowers: Long spike-like inflorescences of small yellow flowers are borne in summer, giving the flower stems a striking yellow-above-green appearance. Fruit/Seed: Capsules are produced from January to March, and split open to release many small, shiny brown to black seeds. Dispersal: Seed is the main method of plant dispersal, either by soil disturbance or minor movement by wind and water. Distribution: Wild mignonette is common throughout the southern Midlands area. It also occurs in scattered populations throughout the State. Cut-leaf mignonette is far less common. Status: Both Reseda lutea and Reseda luteola are declared as Secondary Weeds under the Noxious Weeds Act 1964. 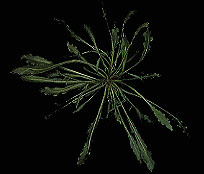 Both weeds are commonly found on roadsides and waste areas. They may compete strongly in poorly managed areas, however they are rarely significant weeds of gardens, crops or pasture. Seedling and young plants may be easily removed by hand or by using hand tools. Plants in their second or subsequent years of growth may be difficult to manually remove due to an extensive root system. Roadside slashing or similar operations may reduce seed production, however this will not kill plants, and may actually assist in spreading seed. The herbicides glyphosate and 2,4-D are registered for use in Tasmania for the Mignonettes. Note: All 2,4-D products may be used without restriction from 15th April to 15th Sept, however use outside of these times requires a permit available through the Registrar of Pesticides, DPIWE. (Ph: 131368). N.B. The herbicides mentioned on this documents may not necessarily be registered for use on the plant referred to. Always check the herbicide label before use.